It is always with mixed emotions that I realize our trade show season has reached its end. It is great to do business and see old friends, but four shows and 6,500 miles in 18 days was plenty for me. Much in these events have remained the same, but a new, ominous element is beginning to make appearances at the large hunting-based shows: We are seeing protesters at almost every event. Our first encounter with protesters at outdoor trade shows occurred a few years ago at the Dallas Safari Club convention. The picketers were out to show the world their disdain for the auction of a black rhino bull hunt in Namibia and the world seemed to be paying attention. Fox, CBS, Al Jazzera English were all there to cover the event, CNN as well, which used some of my black rhino stock footage from a shoot in Namibia. With the world watching the goings-on in Dallas, the protesters were out in force to save this single endangered rhino and show the world what horrible people hunters are. Except the plan backfired. Proceeds from this hunt, 100 percent in fact, were donated to the conservation trust fund to protect Namibia’s black rhino—100 percent, as in all of it. The bull on auction was an older male that was no longer breeding, but was keeping other males away from receptive females, sometimes mortally wounding the otherwise healthy suitors. Put another way, removing this particular bull from the population would not only benefit the reproductive capacity of the herd, the proceeds from the hunt would enhance the efforts to conserve the species. But in this regard, these protesters were a lot like the old bull: They actually hurt rhino conservation. A reliable source at Dallas Safari Club (DSC) told me there were two CEOs of major corporations who had committed at least $1,000,000 to the Black Rhino Conservation Trust Fund for the opportunity to hunt this problem bull. But when the protesters began spewing their vitriolic stream of hate and threats, the potential donors pulled out. There was no way they could risk the public relations nightmare that would befall themselves and their companies if their names were made public. Bailing out was the prudent thing to do in light of the enormous risk the protest created. So instead of raising $1,000,000 or more to help the black rhino, the high bid was $350,000. By their misguided sense of morality, the protesters cost black rhino conservation at least $650,000 in support. But hey, everyone has the First Amendment right to say almost whatever you like in this country, even if that speech is self-defeating. The Safari Club International (SCI) convention in Reno saw smaller-than-usual attendance, but it was still a first-class show. I understand there were anti-hunting protesters somewhere, but if they were there, they certainly were not prominent. What was eye-catching was this strategically-placed billboard on the road between the Reno-Sparks Convention Center and the host hotel, the Peppermill. It pictured a black bear with the words "Not Your Trophy." Trying to turn hunters against hunting doesn't do much to improve wildlife populations or their habitats. Again, First Amendment and all of that, but one has to wonder if an organization really cares about saving animals. Is messaging the patrons of a hunting convention with an expensive electronic billboard the best way to utilize the charity’s dollars? Why not take that money and use it to improve bighorn sheep habitat or research the decline of resident mule deer? 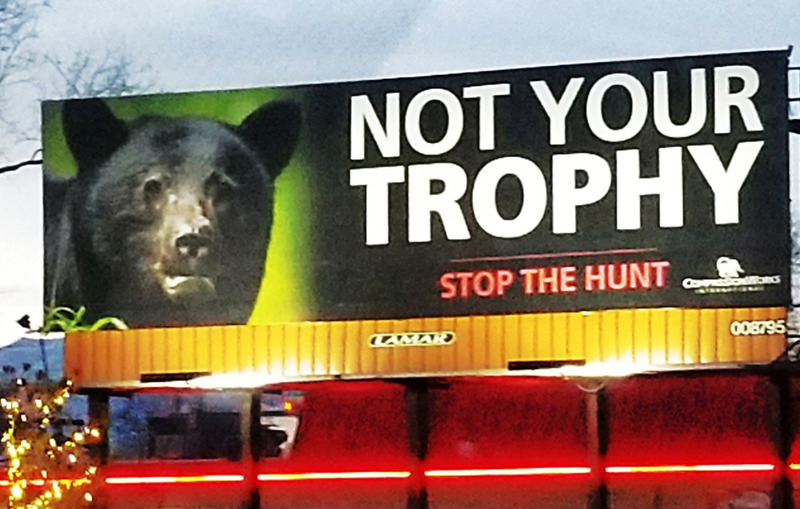 It seems that would do more to achieve the goal of protecting wildlife than protesting hunting to hunters, but then again, it was a really cool billboard. New this year were Houston’s anti-hunting protesters. This is the second year HSC has moved their convention from the suburbs to downtown, and a fairly large crowd of Antifa-looking folks made their grievances known across the street from the convention and under the watchful eyes of a number of Houston’s Finest. Granted, this report has been a bit tongue-in-cheek and it is unlikely a few Millennials with several hours to kill are a direct threat to recreational hunting. But it does illustrate a societal trend that is moving decidedly against our sport. With more city-dwelling, Internet-surfing, non-physically-active Americans become further removed from mankind’s hunting heritage, it is without a doubt that the “enemy” is getting larger and more audacious. It is imperative we redouble our efforts to promote the many virtues of ethical hunting and actively recruit more members into our fraternity of hunting brothers and sisters. If we do not, the morals of the mob today become the wildlife management policies of tomorrow. When that happens, everyone loses. About the Author: Steve Scott is a self-proclaimed reformed attorney, long-time university instructor, and producer and host of the Safari Hunter’s Journal and Outdoor Guide television series. For more information, visit SteveScott.TV. Follow NRA Hunters' Leadership Forum on Twitter @HuntersLead.